A good friend of mine decided to hold a superbowl party last year at his place and enjoy it with a plethora of classic American foods. Buffalo wings being a key component of this event. Being the paleo type, this would not agree with my stomach at all! So, I stopped off at the local shops for some ingredients on the way to the event. I decided to make some nuggets. 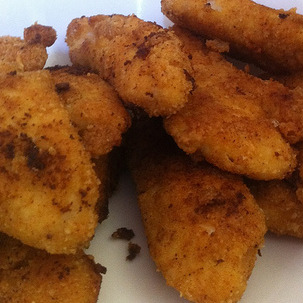 So here we have the Fiery Chicken Nugget recipe. Simple. Effective. Good. 1. Slice the chicken into strips, or cubes. 2. Take the 2 eggs in a bowl, scramble them for an egg wash.
3. Mix the almond meal, rock salt and cayenne pepper together thoroughly. 4. Dip the chicken in egg wash, then coat evenly with almond mix and place on a dry plate. Repeat this until all chicken is coated. 6. Heat your olive oil in a fry pan to a low to medium heat. We dont want the oil getting too hot, otherwise it will oxidise… and thats not great. 7. Place your chicken in the pan. careful not to over crowd the pan, otherwise the heat will not distribute evenly, and you’ll have soggy chicken. 8. Cook both sides till golden. Do not burn the coating. Again, this is not good for you. 9. Once cooked, place on absorbant paper.